Good News! 2 more Royal-repair damage repair Specialists finished training and are ready to join rest of the man to carry repairs in South West London and North East London. Our Specialists are trained to achieve nice and smooth finish when repairing powder coated window frame damages. Wooden Flooring damages like dents and scratches are fixed to best quality.We are able restore any wooden floor or laminate Finishes. After training they are able to match any color and repair all scratches dents and chips to any kind of kitchen unit doors or worktops. 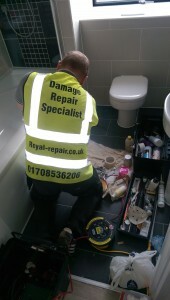 We use only very high quality products to repair any damages caused to Baths, Shower Trays and Basins. Our Materials you won’t be able able to find in any DYI stores. 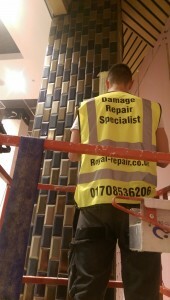 Impressive repair of any damaged or drilled Tiles, marble ceramic or porcelain- we repair them all! Our High Skilled Damages repair Experts are trained how to treat all species of Wood and Laminate damages. All our Specialists carry CSCS Cards and are always ready to help you in Construction Sites. We are the THE ONLY Company in London and surrounding areas that offers Emergency repairs Services to repair any hard surface damages, chips, dents and scratches. Check Photos below before after repairs and few photos of our repair specialists repairing damaged Tiles at Westfield(Stratford) and repairing Bath Chip at one residential property.